Avocent offers advanced options for vital power management tasks at data centers and remote offices. 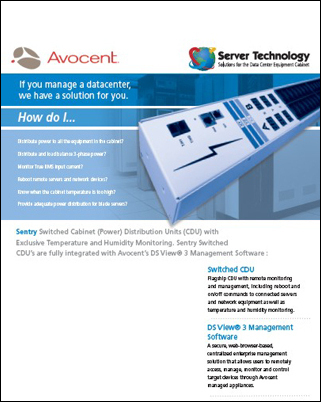 Server Technology Inc., the leader in remote power management , today announced that its Sentry™ Switched Cabinet Power Distribution Unit (CDU) products are now capable of communicating with Avocent’s DSView® 3 management software. Customers that select the DSView 3 management software for their data centers can take advantage of a single interface for remotely and securely managing their CDU’s along with servers and serial devices, making complex network access and control remarkably easy. By using either Sentry CDU’s or Avocent SPC power controllers in combination with DSView 3, server names can be easily associated with actual power outlet ports for more accurate remote manageability. This powerful product combination also provides remote reboot through web-based access, secure authentication and communication, support for devices with redundant power supplies, and proxy sever capabilities. Implemented together, they represent a real advance in power management for data centers and remote offices. “The integration of DSView 3 software and Server Technology’s CDU product family greatly expands power management product accessibility in an evolving cabinet power distribution market place,” explains Brandon Ewing, Server Technology’s executive vice president. “Access to third-party power management solutions through our enterprise DS View 3 software means greater flexibility for our customers who have to remotely manage multi-vendor equipment and power in their data centers and remote offices,” said Dusty Pritchett, Avocent’s executive president of global marketing. The Sentry™ Switched CDU is available for purchase both through Avocent Take Command Program® resellers http://www.avocent.com and from Server Technology. Sentry Switched CDU’s are available with a variety of outlets types with 2, 8, 16, 32 and 48 outlets, and combine remote configuration and management with power distribution and environmental monitoring. Also, 3-Phase products with single or dual in-feeds are available to meet today’s ever increasing power needs. The Avocent SPC power controllers come in a variety of 4, 8, and 16 outlets. Server Technology offers a complete line of Basic, Metered, Smart, and Switched CDU’s for cabinets in data centers along with -48 VDC products for the Telecom industry and a Fail Safe Transfer Switch product family for fail-safe redundant power applications. This “one-stop” shopping approach is unique to the CDU marketplace and very effective for Server Technology customers as they only have one vendor to communicate with when purchasing all their power distribution needs. Server Technology is ISO 9001 certified and all products include agency approvals to the EN 60950-1 standard as well as the CE Mark. Server Technology is committed to the European marketplace and offers RoHS compliant products. Server Technology, Inc. designs and manufactures products to improve power management in data centers at the equipment cabinet level. Founded in 1984, Server Technology is recognized as a leader in innovative Remote Power Management solutions. Products include intelligent Cabinet Power Distribution Units (CDU’s) that provide remote management via IP, input current monitoring, and environmental monitoring. Additional information is available at http://www.servertech.com. Avocent Corporation is the leading supplier of connectivity solutions for enterprise data centers, service providers and financial institutions worldwide. Branded products include switching, extension, intelligent platform management interface (IPMI), remote access and video display solutions. Additional information is available at: http://www.avocent.com. NOTE TO EDITORS: High-resolution images are available for publication. Please email Calvin Nicholson for more information.